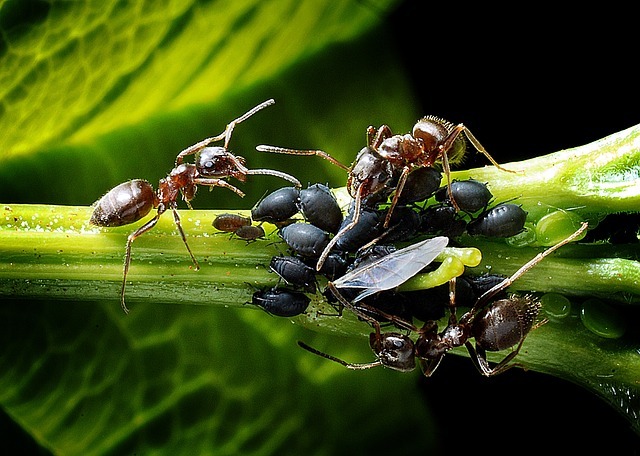 Like most hive pests, including wax moths and hive beetles, ants are opportunists. Ants in your beehive may be a sign of other problems because a strong colony that is both populous and healthy can generally keep them away. Most ant species are a mere annoyance in the hive. They often raise their young in the space between the inner cover and the telescoping lid, or sometimes in the small space between the telescoping lid and the outside of the hive where it is warm, damp, and relatively safe from bees. Up here in the Pacific Northwest I have encountered hundreds of white “eggs”—which are actually pupae—attached to these protected surfaces. I simply skim them away with my hive tool, a five-second fix. However, if you see ants actually traveling into the colony itself, you need to do a hive inspection. Remember, ants are opportunists and scavengers. A weakly-defended hive is an opportunity for easy pickings, so a procession of ants leading into the hive interior may signal that something else is wrong with your colony. Open it up and find out. Weak and failing hives are not the only ones to attract ants. New packages, small nucs, newly captured swarms, and recent splits may not have the bee-power they need to defend against ants. Keep a close watch on these small colonies. The widespread invasion of Argentine ants into many parts of the world, including southern areas of the United States, has caused trouble for beekeepers. If you live in an area invaded by Argentine ants, more than passive control may be necessary. Stories abound of large colonies absconding to get away from invading hordes of Argentine ants. The Argentine ants live in enormous colonies that spread into neighboring areas when a queen walks off and founds another closely-related colony. Sometimes these close-knit colonies even share workers, so rather than fighting and competing, they form vast genetically-similar networks which out-compete local species. These amazing invaders are very small, averaging about 2 mm long. As such, even tiny spaces between brood boxes provide ample space for coming and going. They normally walk from place to place and can be seen in long columns. The ant population within a colony varies with the season, but in North American they peak in October. Although they are omnivores, Argentine ants have a preference for sweet foods, which means they are highly attracted to beehives. All that luscious food packed into one small place with easy access is irresistible. The safest way to remove ants from a beehive is to use some form of mechanical separation. Why? Because both ants and bees are in the order Hymenoptera. Ants are much more closely related to bees than are wax moths (order Lepidoptera), small hive beetles, (order Coleoptera) or Varroa mites (which are not even insects, but arachnids). The closer things are related, the harder it is to separate them with chemical means. Be proactive: You can do several things to protect your hives from ant invasions. Since Argentine ants are walkers not fliers, hive placement is important. Keep your hives off the ground: Ants live in the ground, so any hive sitting on the ground is easy pickings. In addition, when a hive is on the ground it is difficult to see them entering. A stand with six-inch legs will work for ants, but longer legs will provide some protection from skunks, opossum, and raccoons as well. Monitor the legs of your hive stand: To get to your hive the ants have to walk, so take a peek at the legs of your hive stand whenever you can. Remember, Argentine ants are small, so you need to look closely. Remove bridges: Anything that bridges between the ground and the hive can quickly become an ant highway. Look for branches, tall weeds, blades of grass, and wildflowers that may grow beneath your hive stand. Repair your boxes: Yes, it’s hard to keep all our bee boxes in tip-top shape, but obvious cracks can be filled or repaired, joints can be tightened, and irregular edges can be sanded or planed. If it sounds like a lot of work, it is. But it’s far better to mend a box than to lose an entire colony to ants. Carry a bucket: When working your hives, toss pieces of burr comb and other hive debris into a bucket. If left on the ground, these seemingly insignificant morsels can attract ants (and other pests) from far and wide. Build an oil barrier: Probably the most effective defense against the Argentine ant is maintaining a pool of vegetable oil around each leg of your hive stand. Many beekeepers simply set each leg of the stand into an oil-filled tunafish can. Others fill the cans with a solution of soapy water. Soap, a surfactant, causes the ant to drown. If the oil-filled can isn’t to your liking, or if you have some less pernicious type of ant in your area, here is a list of some anti-ant protocols from my readers. The original comments explaining these ideas are attached to the post, “Bad ant advice and the ascension of bees” written back in 2012. In any case, don’t jump to conclusions about ants. Remember, if you open a dead-out or the hive of an absconded colony, the presence of ants doesn’t mean the ants caused the problem. Like hive beetles, wax moths, wasps, and earwigs, ants frequently move into an empty hive to partake of the spoils. The same applies to mold and fungus. Opening a hive after the colony is gone only tells you what is there now, not what was there before. Just as looters didn’t cause the storm, ants may simply be taking what is no longer guarded. Many types of ants live in and around beehives. These ants (species unknown) are hanging around aphids, eating the sweet honeydew that aphids excrete. Pixabay public domain photo. A older beekeeper told me to put walnut leaves under the telescoping cover to get rid of ants. I have put that info into use this year in all of my hives. The hives had ants trying to live on top. I put some walnut leaves in them and not an ant to be found. That’s one I haven’t heard before. Very cool. Thank you for that advice on the walnut leaves. I was in a panic yesterday as I found ants EVERYWHERE on the top board of my newly split hive. I was so happy to have succeeded in my first ever split this spring, only to have the wind taken out of my sails when I found the ants, busily setting up house, moving eggs about and loving the sugar I supplied above the bees. I’ve gone out numerous times and cleaned them off, only to find them up there again. I quickly ran in to pull up “Trusty Rusty” “HoneyBeeSuite.com”, as I remember reading about the ants on your blog. So ……. I put the cinnamon around the bases where the ants dug holes, smashed some more ants, then thought about those walnut leaves. No walnuts trees where we live, so I thought about rhubarb leaves ~~ maybe they are like walnut leaves and I am desperate. Nothing seems to like those leaves, and I was in all out war mode. What can it hurt? I placed them all over the top cover (after smashing more egg-carrying ants), then googled it over dinner. Lo and behold ………… rhubarb leaves are full of oxalic acid!! Poisonous to pets and humans, and it can be extracted to make insect spray!! Now my mind is racing …………… can we make a spray for those pesky mites?! Hmmmmmmmmmm…..
Will check tomorrow to see if the rhubarb leaves worked and let you know. Recipe for the spray is at http://www.peacecountrysun.com. Most the ants I’ve seen in my area, Northern Minnesota, are of the Formica variety; Wood Ants, Field Ants and another variety, Carpenter Ants. None have been a problem beyond using the inner cover as a brooder. Actually, most the ant activities in and another the hive is; hauling of pieces of wax, pollen, bee body parts and such. I consider the ants as the keep up or garbage crew. I’ve been successful removing two colonies. One a cut out and one from an establish colony which required cutting the limb of a tree and taking all and placing it in a 20 x 20 x 20 special box I made (my first capture). Any way, all looked great until I checked on them a day or two later. In each instance, I opened the box and found hundreds of red ants and no bees!!! Subsequent to these hard-learned lessons and many of your mentioned treatment nets failing, I turned to Mann Lake and obtained their insecticide. Sprayed on the perimeter of my colonies and avoiding getting too close to them, I’ve been able to safeguard the bees and make two successful splits. KNOCK ON WOOD.!! Congratulations. Ants are the worst! Hi Rusty as always thankyou for the wonderful information on your website. Cinnamon has worked well and also Vaseline on the legs. I use water instead of oil. I have not tried soapy water, would the bees try to drink this water? I don’t know. I imagine they wouldn’t like the smell, but I haven’t read anything about it, and I haven’t tried. Ed Crockett, NE Tacoma, WA 1st year with 2 honey bee hives, 5 years with mason bees, urban area. Saw your post on moisture quilts and I will build a couple of them, but have a few questions, what type of canvas do you use and where do you get it from, I have run into different types? And when do you put it on, and I assume you remove the inter cover/top to do this? Next I have decided to do the oxalic acid dribble, however when I was getting supplies at Howard L Robins/Robins Honey Farm in Lakewood I picked up Oxytetracycline HCL, soluble power, a broad spectrum antibiotic, for control and treatment of specific diseases in poultry, cattle, sheep and swine, is this the same thing or not? Next I saw your post on no-cook sugar patties that you used a plastic queen excluder and a 2×4 for ventilation and now I cannot find it! And do you put this between the brood and the moisture quilt? I like reading your blog and I have a lot more questions as well. “And when do you put it on?” As soon as I see moisture condensing on the inner cover, which is late October or so. “And I assume you remove the inner cover/top to do this?” I remove the inner cover for the winter when I put on the quilt. “Next I have decided to do the oxalic acid dribble, however when I was getting supplies at Howard L Robins/Robins Honey Farm in Lakewood I picked up Oxytetracycline HCL, soluble power, a broad spectrum antibiotic, for control and treatment of specific diseases in poultry, cattle, sheep and swine, is this the same thing or not?” Definitely not. Oxytetracycline is a broad-spectrum antibiotic used in beehives to control American Foulbrood. You can buy oxalic acid in the form of wood bleach at Home Depot. Look for it in the paint supplies/wood preparation section. “Next I saw your post on no-cook sugar patties that you used a plastic queen excluder and a 2×4 for ventilation and now I cannot find it!” No-cook candyboard recipe can be found here. “And do you put this between the brood and the moisture quilt?” Yes. Ants secrete formalin, yes? What would happen if the honey bees take the honey with the dead ants, and intake some formalin? Possible prevention or ill? Ants secrete formic acid (also known as methanoic acid) which is the substance that makes their bite sting. Formalin, on the other hand, is a solution of formaldehyde in water that is frequently used in specimen preservation. Formic acid is naturally occurring in honey in low concentrations, and is the basis for some miticides, such as Mite-Away Quick Strips. The effect of a bee eating some formic acid would depend on how much it ate. 08/09/16 I use cinnamon for ants. Other years have been pretty good, but this year the northeast is hot. My other question is : I had a beekeeper down south tell me he does not use mite-away to control mites. He uses powder sugar mixed with vegetable oil or corn oil, mix it til it is doughy. Have you ever hard of this? Yes, I have heard of things like this, but you have to ask yourself how it works. The theory is that slippery substances like oil make it difficult for the mites to hang onto the bees. But it rubs off and mites quickly re-attach themselves. And mites running around inside a hive don’t need to ride on a bee, they can walk to the nearest open brood cell. Does it reduce the number of mites in a hive? Probably. Does it reduce the number enough to matter? In my opinion, probably not. I left some royal jelly in hatched queen cells laying around and the little sugar ants discovered them. There were hundreds of them surrounding the cells and carrying off the nutrient rich treasure. I decided to try borax after spending over $100 in professional grade chemicals over the last few months. So I mixed table spoon of mule borax, with a table spoon of sugar, added maybe half teaspoon of honey for flavoring and just enough water to dissolve it all. Dropped the mixture where the ants were previously foraging and caused a genuine Mongolian invasion of ants. The effect in 10 minutes was very disturbing, but in a few hours, it got dark and the ant numbers dwindled. Immediately I did not know if it was temperature or time of day dependent, so I went to bed. By next morning there was not an ant in sight. This made me feel really foolish as borax is so much cheaper and more available than other stuff I bought. Will be using borax from now on. I think using it outside near bees might be more serious challenge, but it does work pretty well if you can manage to keep bees out of it. Using sour cream plastic jars with small holes, might be an option. I’ve read that if the solution is too weak, it won’t kill the ants. But if the solution it too strong, the ants will die before they take it back to the nest, which is where you want it to go. I don’t know the proportions and I’m wondering if your ants managed to take it back to the nest. I may try this the next time my ants appear, which is usually in August. Resesearchers in New Zealand (Prof. Lester et al, Victoria University of Wellington) found that Argentine ants (Linepithema humile) have the same deformed wing virus strain found in honey bees. Hmm. Interesting for sure. I wonder what that tells us. Good post on the ants. I’m in NorCal & have been using cedar oil on the outside of the hive. It’s mostly working but I have to keep applying every couple of weeks. By mostly, I mean I am not seeing lines of ants making their way up the outside of the hives anymore. I am currently feeding divert on the top of the inner cover and the bees are not interested but the ants sure are. They are the little tiny ones and I think they have a new very small path inside the hive to make their way to the top. If the bees are not interested, perhaps you should stop feeding it for now. Once the bees are interested, they will most likely keep those small ants at bay. We have a well established hive that we have ants everywhere in the hive what can we do to get rid of the ants and save the bees? If one of the ideas in this post won’t work, then I don’t know what else to do. I just bought my first 2 [nucleus colonies] yesterday. We had a sugar tray inside to help the bees out until they find food/flowers etc, a water stream is about 8-9′ from the hives, I had made a hive stand approximately 16″ x 60″ & about 12″ off the ground. This morning after going & checking the hives found ants everywhere, the bee supplier told us to rub oil all over the stand before hand, so I did this before setting the hives. Can I close the hives & move them for a few hours & try something else like a water or oil tray under the legs then put the hives back & open them again? Yes, you can close the hives and move them while you work on the ant problem. At this point, you should wait until evening when all the bees are inside for the night before locking them up. Then you can move them anywhere you want in the morning. This is my first year with bees and often read your blog for tips! Thank you! I was having trouble with some very large black ants in one of my hives. Every few days I tried one of the suggestions on your site. I tried the walnut leaves first; it seemed like the ants just liked the extra cover. I tried the wood ash all around the base of the hive in a very deep pile; ants just walked across. I tried a thick coating of vasoline on the stand (I have a plastic stand with very thick leg that I can’t put in a can). The ants weren’t even slowed down. The ants were bringing in eggs and making a commune in the upper box where I keep my feeder and it was really getting out of control. I didn’t have any cheep cinnamon at the moment, but I did have a small jar of cinnamon sticks, so I put them in the four corners of the upper box. Much to my surprise, the sticks did the trick. They had all left the box completely! An added bonus was that the sticks were easy to pick up when I needed to check the boxes below, and then could be reused. I think different ant species require different techniques. You were wise to just keep trying. I have been keeping bees for about 20 years, and have had problems with ants on and off. A few years ago I started using diatomaceous earth in saucers to put the hive stand on, which worked except that bees kept falling into them. I then used inverted pie pans to shield the saucers from bees (and rain water). Then I found a stand that basically does the same thing properly. And has an amusing name. I still use diatomaceous earth in mine (mixed with cinnamon and cayenne), but it would work well with oil too. Wow Jeremy, that trade name competes with my two favorites which are Rabbitat (housing for rabbits) and Destroylet (a propane-burning toilet). Thanks for the update and information. Cinnamon! Works for me every time on good old UK ants. Just sprinkle it where you see them in the hive. Also clean up any syrup spills and dropped burr comb outside hive or cover board. I made a PVC stand that holds a wood shipping pallet, and the 4 legs sit inside coffee tins filled with vegetable oil. No more ants! ~The bees only defense is the natural comb and the natural ball of bees. ~Bees are unable to fend off an ant attack inside any box that uses hive frames. Top bar hive fair much better only if the colony is established. But ants can force ANY size colony away. ~Ants have the upper hand with screen bottom boards and hive frames. ~Argentine Ants form super colonies (multiple colonies working as one when needed) and colonies join together when they find bees. ~The bee yard ground must be weed and grass free or you will do the required weekly weed-wacking; which the bees will not appreciate. ~Ants will make bridges with a single blade of grass. Scout ant to ant bridge to bees balling on the outside and leaving can be within 45 minutes. ~On bare LEVEL ground or on top of weed fabric you will set 12 inch by 12 inch concrete step pavers under each leg. The pavers are less than $2 each. The pavers must be level with each other. ~ Each ant proof leg is comprised of the following pieces: -two each 1/2 galvanized pipe flanges, -one 6 to 10 inch 1/2 galvanized threaded pipe and -one 3/4 stainless steel shower flange. ~The stand is 2 x 4s in an ladder pattern but put the boards flat and over lapped; choose your length and I use four legs for 4 feet in length and six or more legs for longer stands. ~Make the wood stand. Position the half of the galvanized flanges on the stand and screw them in. ~Take the 1/2 pipe and push the 3/4″ shower flange on the pipe so it looks like a umbrella. It will stop at the bottom of the threads. ~Screw the other galvanized flange on the other end of the pipe. That the bottom of the leg. Now you have a free standing leg with the umbrella grease cup. Inverted to divert rain and dirt. ~You will smear HIGH TEMP automotive grease in the shower flange and screw it in the stand. ~Screw the legs in hand tight. and flip over the stand and position it on your 12 x 12 pavers. ~Weekly inspection at minimum. Weeds must not creep up and make any bridges. ~Every 4 months take a popsicle stick and smear new grease over the old or remove the old first if that will bother you. If you keep the weeds at bay and the grease in check. You will not have ants on the stands. They will be all over the ground stealing hive bits and dead bees and they serve that job very well. It’s a win-win. I will send Rusty pictures to share. I’d love to see pictures of this!